This chest is made from mild steel which has developed it's own unique patina. . It is 720mm x 480mm x 480mm. 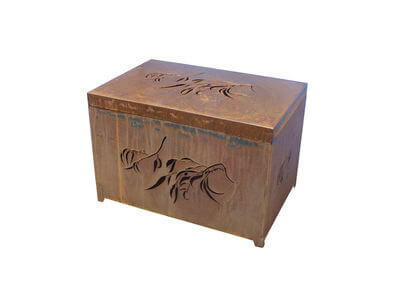 This rusted metal chest is perfect for storing wood, gardening tools, outdoor shoes and many other uses. They would also make a great outdoor coffee table for the deck or courtyard with the added bonus of storage space.